PrecisionCraft offers six distinct architectural styles, each with a large number of conceptual floor plans from which to seek inspiration. Because each person is unique, there is no “correct” approach when beginning the planning of a PrecisionCraft home. For example, many PrecisionCraft clients prefer to browse individual floor plans. An equal number first choose an architectural style, and later narrow to a final floor plan design concept. 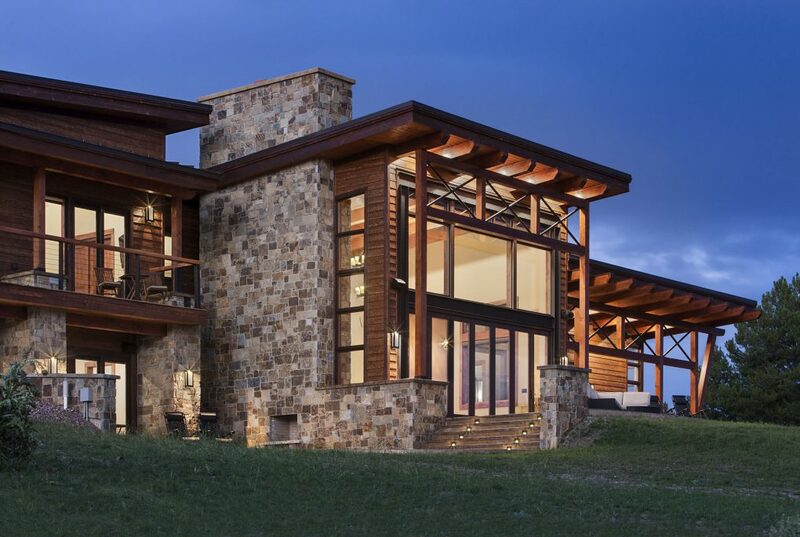 Regardless of how you begin planning your luxury log, timber, or hybrid home, learning more about PrecisionCraft’s six architectural styles will help make your decision easier. 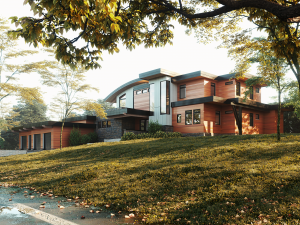 Part One of our Architectural Styles series introduces two of our collections, the more contemporary Mountain Modern™, and Western Heritage, a collection of classic lodge-style homes. After reading this article, you may find yourself with a clear preference for an architectural style. Conversely, you may find yourself torn between design styles. French poet and novelist, Victor Hugo, once wrote, “Concision in style, precision in thought, decision in life.” This series of articles seeks to assist you across all three as they relate to your luxury log or timber home. Enjoy! The talented group of architectural designers at our in-house design firm, M.T.N Design, first debuted the Mountain Modern™ collection in response to the rediscovery (if you will) of the much revered mid-century modern school of design. From Eero Saarinen to Frank Lloyd Wright, the surging popularity of mid-century architecture first resulted in our Cascade conceptual design. The Cascade swiftly captured the eye of many PrecisionCraft clients who customized the home design to meet their needs. The result? Several astonishing homes across the United States and Canada. Because the Cascade design concept was so popular, M.T.N Design created additional modern mountain architectural designs. Included are the Brighton, Crescent Rim, and Sun Prairie. Nowadays, with nearly twenty Mountain Modern™ floor plan concepts and counting, there is no doubt that the essence of this inspiring, fresh, collection is authentic mountain-style architecture flavored with modern style. And, though there are distinguishing elements between the floor plans, they often share unique architectural elements. Some of these shared characteristics include the integration of metal accents and large walls of glass. In addition, they feature the flat, sloping, roof lines so closely associated with mid-century modern architecture. The signature look of this style of home is impossible to forget because of its angular walls, timber frame structures, and even milled log walls. In the end, the results are stunning, contemporary homes that organically blend into their surroundings. Read more about modern mountain log and timber homes and enjoy additional photographs here. Born from the classic lodge style, Western Heritage style homes go beyond average expectations, standing out amongst their landscapes. Combining authentic log and timber construction with an abundance of glass and metal accents, these rustic gems are in a class all their own. Some of this distinction is attributable to the Western Heritage style’s incorporation of the always magnificent prow. Additional characteristics of this beloved design style include significant use of stone and an abundance of large windows. Western Heritage style homes also typically boast expansive outdoor living spaces such as outdoor kitchens and master suite walkouts. 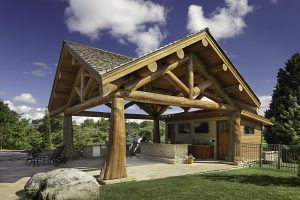 Western Heritage style combines authentic logs with timber construction. Other elements include thick roof systems and fascia, along with massive fireplaces, lofts and walk-out basements. In addition, casement windows are a frequent choice because they allow for unobstructed views. Finally, indoor spaces offer an easy flow to patios and decks. 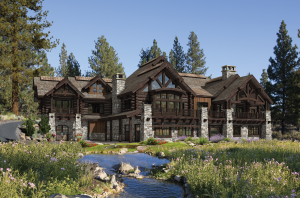 From their mixture of angles, roof lines, and wood building materials to their large scale elements, like those of our exclusive Eagle’s Nest conceptual design, the powerful presence of a Western Heritage style home is instantly memorable and endearingly impossible to ignore. Browse more of these western gems here. M.T.N Design is PrecisionCraft’s in-house, award winning, design team. These architectural designers modify PrecisionCraft floor plan concepts based on client needs and lifestyle. However, many PrecisionCraft clients prefer a home designed completely from scratch. Thus, whether you find inspiration from one of our 60 plus design concepts, have an existing plan, or want a fully custom home, M.T.N Design services will satisfy your need. Read more about M.T.N Design here. Please visit our website in two weeks for Part II of PrecisionCraft’s Architectural Styles series.